Barnacle Quartz Crystal A Barnacle Quartz crystal is described as "The random outside attachment of several to many smaller crystals to the host." That is... barnacles are smaller crystals covering some part of a larger one. These are also called Fairy Dust crystals. Barnacle Crystals are for meditation. As, you know the relationships and things you accumulate in your passage through life are not you. Do not confuse yourself with your relationships and your things. A Barnacle is a good crystal to use in the beginning of a meditation session. It will help you find yourself - the first step in finding your future. Bent Crystal A Bent Crystal is "One or more crystals which broke and visibly rejoined at an angle to the shaft(s)." A special form of the "Self Healed" crystal, a Bent Crystal is used as a personal talisman to aid in the spiritual recovery after a personal loss. Sometimes a relationship, family, or life cannot be put back together after a death, serious injury, or other major trauma. Recovery takes life on a new path after the old one is shattered. Strength is slowly regained, but the form of life is forever altered. Use a Bent crystal as a meditation aid to understand and facilitate re-growth. It will help you focus your energies on re-growth and healing. Beta Quartz Beta Quartz does not exist at a temperate below 573 degrees C. Some quartz crystals are pseudomorphs of Beta Quartz crystals. They are composed of hexagonal dipyramids, which are a pair of opposing six sided pyramids, and the crystals lack prism faces. Technically these crystals are Quartz after Beta Quartz. Beta quartz is a used for understanding dreams and bringing the Universal Life Force energy to bear on a complex and difficult problem. 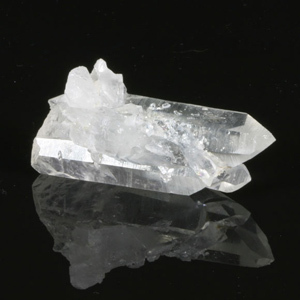 Beta quartz is a meditation crystal that should be kept for very special occasions. It is rare and valuable. Black Shale Phantom See Shale Phantom. Black Tourmaline Quartz Quartz with inclusions of black tourmaline needles. The black tourmaline brings this quartz a protective color that actually gives you a sense of power. It makes you feel secure, daring, and physically powerful. These crystals will help relieve you of fears specifically associated with your physical existence here on Earth. Like all black crystals, these black tourmaline quartz crystals are very synergistic with light green crystals to provide you with safety and confidence. 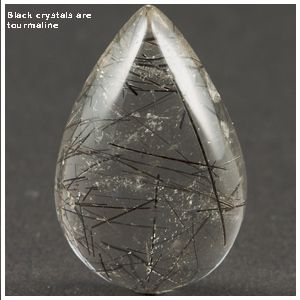 Like other tourmalated quartz crystals, the black tourmaline quartz crystals are primarily used as personal talismans. Find one small enough to either carry in your pocket or make into a necklace. It will help you focus your efforts to be safe and confident. Black Tourmaline Quartz Crystals are also reported to be powerful healers. In The Book of Stones, Robert Simmons notes that will help you clear yourself of the "bad vibes" and negative energy if you carry it with you as you travel. In the same text, Naisha Ahsian finds it to have great power of both spiritual and physical purification. Melody reports that Black Tourmaline in Quartz can actually turn back an evil spell that is cast upon you. Blue Tourmaline Quartz Blue Tourmaline Quartz is quartz with inclusions of blue tourmaline. The blue tourmaline brings this quartz the ability to help you have respect and compassion. Like all dark blue crystals, the blue tourmaline quartz crystals can teach you humanity, discretion, and honor. Blue Tourmaline included quartz will help you be more charitably, and focus your efforts on service to others. They teach us grace, sensitivity to the needs of others, and tenderness in our dealings. Like other tourmaline quartz crystals, the blue tourmaline quartz crystals are primarily used as personal talismans. Find one small enough to either carry in your pocket or make into a necklace. It will help you focus your efforts to be kind and understanding in your dealings. Blue Phantoms Blue Phantom Quartz crystals contain phantoms (inclusions that appear to be a slightly smaller crystal) that appear gray or blue caused by shale inclusions. These are from Arkansas and are natural. See Shale Phantom. Bridge Crystal A Bridge crystal is a smaller crystal growing out of another at nearly a right angle with the base of the smaller crystal inside the larger and most of the smaller outside of the larger. (If the smaller crystal extends from the larger in both directions, and part of it is completely enclosed within the larger it is not a bridge, it is a Penetrator. If no section of the smaller one is completely contained within the larger, and both ends protrude, then it is a Cross Crystal. Traditionally, a Bridge crystal is used in spiritual healing to allow the healer to allow the Universal Life Force to easily move from the spirit world to the physical one to aid in the healing process. You can use a Bridge crystal in meditation efforts to grow your spirituality. In healing, they are used in conjunction with more specific healing stones as facilitators and conduits. They work best in activities involving two or more individuals, such as healer and patient. This is also considered to be a stone of peace and enlightenment, bringing the wisdom of ancient Chinese cultures to today's world. Burr A burr is a "completely three dimensional cluster as in children's jacks: the best specimen would have no center matrix and points radiating from the center only." 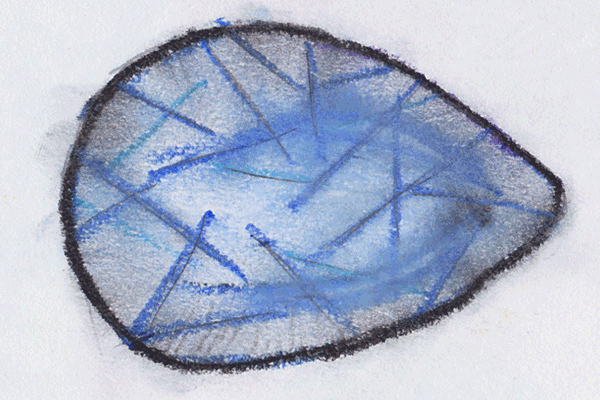 Burr is a poor name for a phenomenal crystal. A Burr has no base, no limits, and no restrictions. The burr is freedom. It is joy and it is unfettered learning and growth in all directions. Burr Crystals are crystal formations used in Feng Shui applications where difficult corners and restrictions affect the flow of Qui, the Universal Life Force. Burr Crystals are energizers and multi-directional amplifiers of the Life Force. They will liven up dark areas of your home, your consciousness, and your life by allowing the free unrestricted flow of the nourishment of the Life Force. Cacoxenite Quartz Quartz included with cacoxenite, a gold, yellow, or red/brown mineral. Most is from Brazil. Cacoxenite is a stone of spiritual evolution. It promotes the conscious travel beyond the physical body. It is used to expand the awareness of the consciousness and aids in healing the crown chakra. It is used to facilitate communication with guardian angels. Often used by those that channel information from spirits and the spirit world. Cactus Quartz See Spirit Quartz. 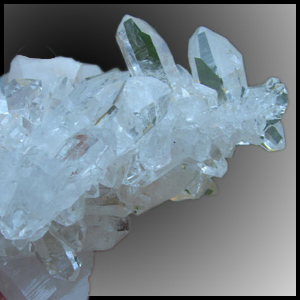 Candle Quartz Candle quartz is recognized by a myriad of smaller terminations surrounding a larger central point. The smaller ones can be either very sharp, as found in tranlucent candle quartz, or almost rounded as is usually found in opaque crystals. The sides of an opaque Candle Quartz often look and feel like a pineapple. If the smaller ones are sharply defined and just around the base of the crystal, then the formation is called an Abundance Crystal. Candle Quartz is often, but certainly not always opaque. It is found both in single crystals and in clusters. Candle Quartz is frankly a difficult tool for anyone to use effectively. It is contrary and rough. But in the hands of an adept, Candle quartz shines! Candle Crystal Candle Crystal – This is a crystal with a ratio of 6 to 1 or greater length to width. 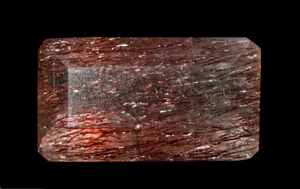 It is also know as an Artemis crystal. Artemis is the Greek Goddess of the Hunt, the Forest, and the Moon. She is a strong Goddess and often vengeful. She is the eternal virgin. She is feminine power. Artemis crystals are used in worship ceremonies for Artemis, and as talismans for strength and fortitude by women when they need strength to weather difficult problems. Because these crystals look like candles, they work well in small groups as a Yin energy booster in a room or home. Combine them will small tree branches or greenery for even more energy. Carved (Natural) Quartz A crystal that has a triangle naturally carved into one of the faces. The triangle may appear to be somewhat opaque or white. Carved Natural Quartz crystals have been reported to be beneficial in meditation when the effort is to contact beings of different energy levels to exchange information. Carved Natural Quartz crystals are also reported to be effective in dowsing, and as simple yes/no divination crystals. The markings should be examined for their alchemist meanings. 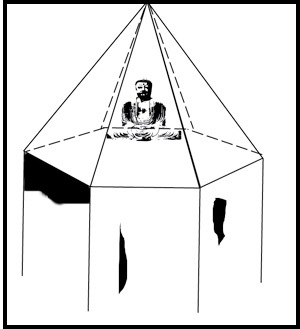 If the triangle faces upward towards the apex of the crystal, the crystal may well have elemental fire energy. If facing downward, it may offer the benefits of the water element. 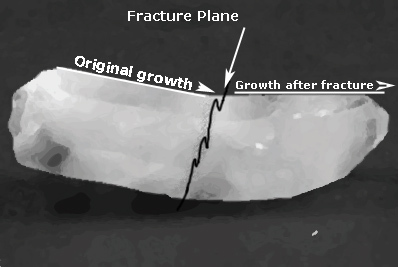 Note: Crystal is illustration only, the carved portion was added in Photoshop to illustrate the formation. Not natural. Castellated Quartz See Castle below. Castle Quartz A castle is a form of twin with many points and extra facets on the tip. Many of the faces will reflect light at the same angle, giving the appearance of a castle. It is a self-healed crystal. The crystal broke from its matrix or another crystal and continued to grow and heal the rough base or side. It is similar to a Cathedral but lacks the larger center termination of a Cathedral formation. Being a form of Twin, a Castle Quartz has the ability to focus efforts aimed at unity. But unlike a Soul Mate or Tantric Twin, both of which are used to facilitate unity between two people, a Castle is a unity stone for families in particular. The Castle Quartz has a single base, just a as member of a family have a common heritage. These are Feng Shui crystals primarily. They are used to bring the Life Force to family gathering areas and focus energy on unity, common purpose, and harmony. Castle Quartz Crystals are often found in formations in which several crystals are seemingly at odds with the overall crystal, illustrating the power of differences without loss of harmony.